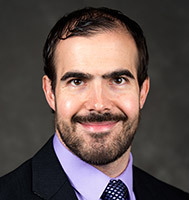 Dr. Hall is an assistant professor in the Department of Medicine at the University of Wisconsin School of Medicine and Public Health, Madison, WI. He specializes in treating patients with blood cancers including leukemia, myelodysplastic syndrome, multiple myeloma and lymphoma as well as managing patients through bone marrow transplant and CAR-T therapy. He has a special interest in acute leukemias, myeloma and new techniques for allogeneic stem cell transplant.